Hello friends! Another food entry it seems. Well, what can i say. Last weekend was one of the best weekend that i have ever lived. 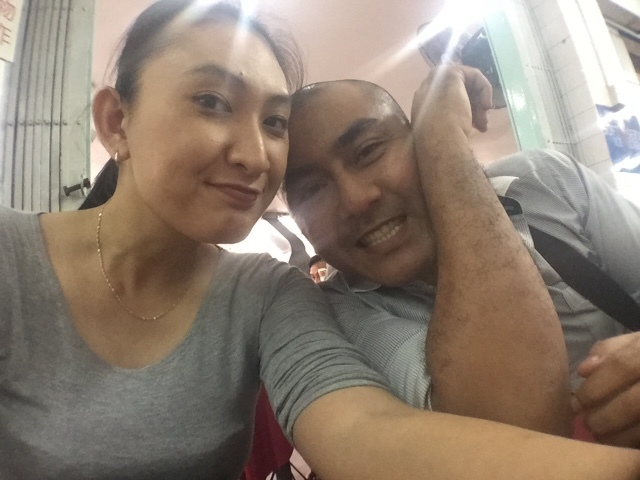 Spend more of my time with the man i love, with my friends as well. 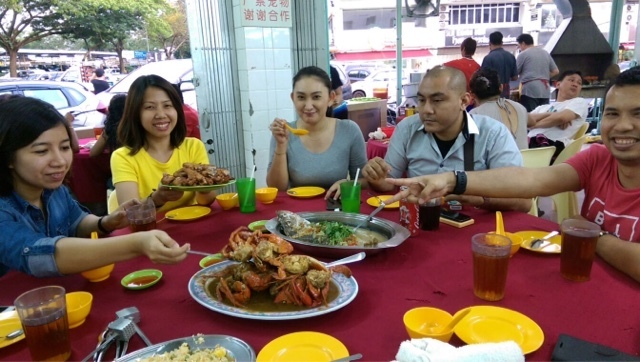 So, last saturday, me and my friends decided to have dinner at Fatty Crab restaurant at Taman Megah, Petaling Jaya. I am not a big fan of crab and i cant eat it cause i am allergic to it but boyfriend can eat crab and i have always wanted to bring him to some seafood place so i thought this could be it. 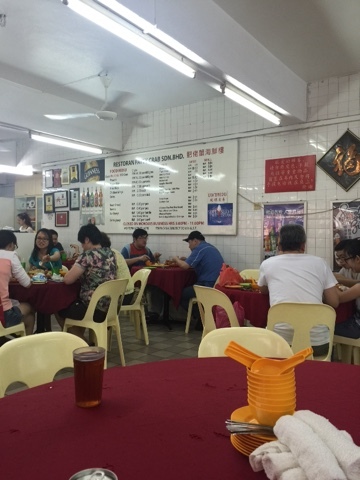 I have never been to Fatty Crab restaurant before to i googled the direction to the place. It was quite easy to find using Google Map. I always rely more on Google Maps rather than Waze. Hehe. The restaurant look like a tipical Chinese seafood restaurant. It has that red table cloth with spoons and chopsticks and plates and mini bowls on top. 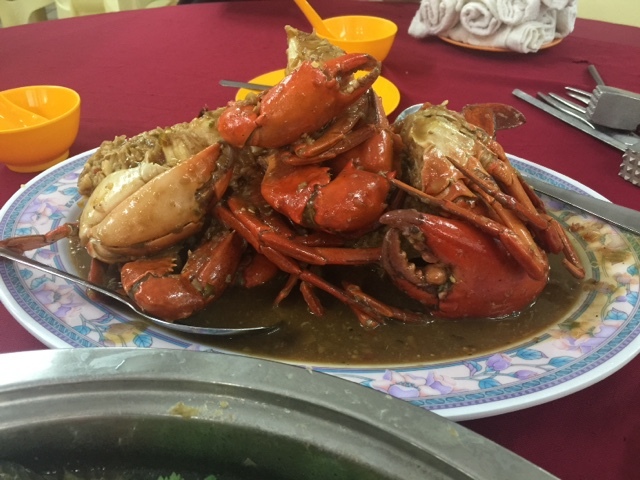 They have quite a limited menu but every table ordered the famously chilli crab. So this guy ate more crabs than he usually does! Haha. Well, for once i think it is okay to loosen up a bit and let him enjoy what he deserves to eat. I mean, i dont eat crab but that does not mean that he cannot enjoy crab meals. Well, i am a nice girlfriend dont you think? Hahahaa. These are some of the foods that we ordered. Since i dont eat crab, Murni my friend decided to ordered some steam fish and chicken wings (not in the pictures above). As for the crab, we ordered 5 kati at first but since there are 7 of them eating the crabs, we added anothe 3 kati more! There you go! Murni (in yellow) holds up the chicken wings! Oh yes, we also ordered some fried rice and breads as well to eat with the gravy of the chilli crab. They were super full with crab that night. I am the only one who is full with chicken wings. Haha. 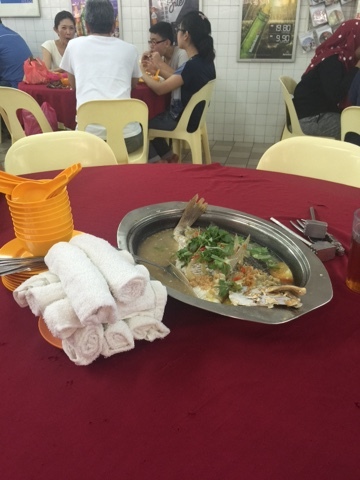 The fish is quite nice too although i dont really fancy steam fish that much. Our total bill was about RM 400++ which is super cheap compared to other seafood restaurant. No wonder people queue for these delicious chilli crabs!